many paces ahead, as i was wiping the sweat that collected on my brow, and betraying the otherwise breathtaking albeit breathless ascent, was one of my trainees, heyjay, humming the chorus of "half crazy". we were stuck in that part of the song, and repeated all the eleven words at regular intervals during the course of the trek. the song may very well have described my mental state at the time for agreeing to be a GL, yet again, for a training climb where i had little support from other members. my load was impossibly heavy, and i was terribly wanting in proper physical training, but i wouldn't pass on the opportunity, of course, to return to a place of amazing wonder. i have been this way before, and my return to it a year later was an affirmation of a previous declaration that this would be near the top of my list of favorite mountains. since jay was within earshot, i sang the chorus with him. "'cause i'm half crazy," i sang, with as much emotion as i could muster in that confusing state of difficulty and captivation, and continued, "feeling sorry for myself, half crazy..." and my voice trailed off, not knowing the words that came after. but this last phrase held true for me. i really felt sorry for myself, in a way, because my load was terribly heavy. from the start, i was bogged down by a liter of sauvignon blanc still in its bottle, four liters of filtered water in my MSR dromlite, another liter of absolut vodka kurant inside a sigg bottle, 1.5 liters of white gas in 2 separate MSR fuel bottles, 2 MSR stoves, my TNF talus 23, 2 hard-bound books, 4 notebooks, a pro-lite 3 thermarest, my altec lansing inMotion speakers, my personal effects... i preempted muscle cramps by mixing a tablet of oral rehydration salts with a liter of gatorade. and i had also started on a powebar gel, which i thought tasted a little funny. yes, i was a little half crazy. but the term could not have described alvin, the climb TL. he had this idea -- which was i think too brilliant it bordered on being insane -- of reversing the itinerary. at first, i thought it wouldn't make much of a difference because the climb was a series of steep ascents and steep descents, akin to the now overused analogy of the outstretched fingers of one hand. but as i contemplated the last push leading to the first campsite after refilling our bottles with water that cascaded down a steep rock wall that resembled a severely-beaten asphalt road, i couldn't help but think of it as madness. he was, in my opinion, crazy and a half. we had started on our trip to kibungan from chow king along session road. i don't particularly recall how long or how short the trip was during the previous year, only that the bus that took us there now felt a little more comfortable: cushioned seats and a lot of elbow room. but when the mini bus turned left towards kibungan, i felt there was something amiss. it lurched upwards slowly and it snorted at regular intervals, as though it had a hard time carrying its own weight. the views of the outlying mountains were only starting to be revealed, and in the pale morning light, as we entered places where clouds don't hang in the sky but sit on the ground, the landscape turned from stunning to even more stunning. layers of black mountains and strips of fluffy clouds moving in like a lazy river of cotton appeared on our left, while on our right was a wall covered with small, violet flowers. we reached kibungan over an hour behind of our itinerary, and we still had to take a truck to the jump off, at the edge of a road that had been paved unkindly by a sick bulldozer. from here, it was hard to describe our trek, although there appeared, far away, a scar on the mountain's face, and i assumed it to be the trail. the trek would take us on a counter-clockwise route around the mountains of the municipality, ending 3 days later at the municipal hall. we descended upon a few rice terraces, then crossed a long hanging bridge, the first of many in the succeeding days. from there, it was an uphill climb through reeds and along narrow rice terrace rip-rap. 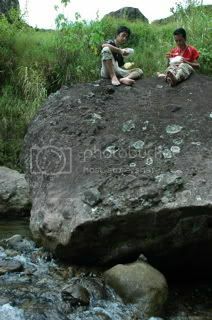 we had lunch along a small stream that spun around big chunks of rock. orange, blue, and green dragonflies with their luminous and bulbous eyes kept us company. while we were there, children were walking towards the road. we pushed onwards with the trek, and it must have been a testament to my poor memory, when i said it would be generally rolling until the water source. in fact, it was not. i will confess that i felt very dizzy at some point, and i thought about disposing of the white wine or maybe the books that we were to donate to the local school. 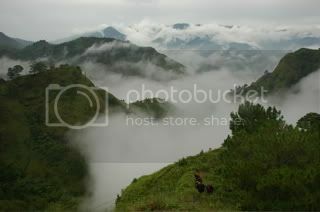 we regrouped at the water source, even as fog silently crept in, blotting out nearly everything beyond 10 meters. it was already 4pm, and despite the surrounding beauty, the trainees were restless, and asked if we were near. "wag kayong mag-alala," i reassured them, "wala nang akyat baba pagkatapos nito," i paused, and smiled rather suspiciously. "puro akyat na lang." we were already two full hours behind the itinerary, and we estimated the trek to be around 2 more hours, so we asked everyone to prepare their headlamps. i walked behind paulo and brody, the latter making frequent stops at the most inopportune moments, breaking my steady cadence. more than once i'd find my face or my head bumping into his pack, his predilection for pausing interfering with my momentum. the trail was steep, to say the least. crude steps had been carved on faces of rock. i remember it had been a battle of balance going down this trail the previous year. but this time around, the battle was fought differently: it was a joust with gravity, and we were severely bruised, though still standing. brody kept remarking about ugo's tey's revenge being a mere footnote compared to what we were assaulting. i said the comparison was more appropriately made to akiki. despite the punishing ascent, the views around us were fantastic. behind us, the outlines of distant mountain ranges would intermittently appear and disappear, based on the movement of the clouds. gullies below us rose from unknown depths into inverted green triangles. on either side, we were hedged by nearly vertical walls of rock and sparse vegetation. the peaks of these ranges would turn into islands, surrounded by a sea of clouds. someone had asked about how these were formed, and i started on a lecture about geology. i would keep saying that at the end of the ascent would be the campsite, and i mentioned that it was just up there, up there, at the top. but i myself may have been fooled, perhaps by a sketchy memory of a previous experience, because i was surprised to find myself there, still looking up at a great expanse, wondering when the uphill climb would end. we paused momentarily at a small flat where a few pine trees and some small brown ferns grew. from far away, i would hear someone shouting, "ang ganda! ", although the strain in the throat sounded more like a complaint than a compliment. eventually, i pointed at a fence. there's the campsite, i said. a darkness was already creeping in, and i wanted to make sure to be there just before the last light of day. 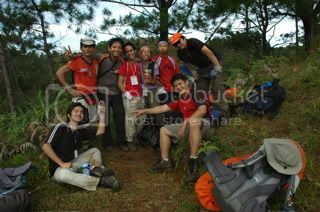 i sauntered up the trail, calling on my trainees to follow me closely, and found kuya mar, shouting not far away, declaring the location of the campsite. i immediately found space for my tent just as i turned my lamp on, even as jay and kim were discussing how to pitch the tent they'd borrowed. i waited on my tentmates, and before long, two TNFs of the same model from different years stood. i put up our tarp, and by the time everyone had arrived, jay and kim were organizing our kitchen. jay volunteered to prepare a tuna pasta putanesca in garlic vinaigrette affair, and i just kept watch over my wards as the evening draped over the horizon, leaving a few lights twinkling in the distance, possibly homes illuminated by gaslamps. we ate peacefully that evening, the cool evening wind kissing the parts of our bodies exposed. the putanesca was good, and we paired it with focaccia bread and white wine. after a while, we gathered around the kitchen of sir manny's team to do socials. prior to that, TL alvin just moved lights out to 11pm, citing the delay in our arrival at the campsite. shots quickly circulated, and without much notice, kim was clearly inebriated, speaking in a voice louder than mine, and bugging alvin about 15 more minutes, 15 more minutes. just after 11pm, i decided to shut myself inside my tent. i slept well that evening, and woke up to paulo's alarm. i told them to head out and start on breakfast, and brody whispered "snooze muna". "walang snooze snooze," i said, and pushed them out. when i opened my door, i found out that kuya mar and mawi had slept outside, just under their kitchen tarp. it was a wonderful dawn with a clear sky and many stars in attendance, although any hint of a fantastic sunrise was absent. for breakfast, we prepared pita pockets with adobo and corned beef filling. it was very quickly prepared, and it was perhaps one of the yummiest breakfasts i have had in the mountains. i won't claim originality over it though, because i'm sure i borrowed the idea from someone else. that morning, the entire campsite was bathed in a clear morning light. the sky was generally blue, with streaks of white and hints of orange and red. pine trees surrounded us, and the air was crisp and fresh. we started the trek shortly after 8am, and less than 250 meters from the campsite, on more or less even terrain, paulo slipped, used his hands to break the fall, and very clumsily sat on his left hand. he didn't rise immediately and i suspected there was something wrong, because his face wasn't locked in its usual clueless stare. he winced, and let out a silent scowl. i immediately took his hand, felt for anything broken or displaced. i told him to wiggle his fingers. check. move his hand from his wrist. check. i said we'd bandage it at the next rest stop. 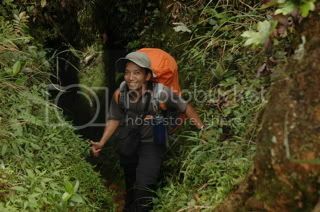 from the campsite, we descended deep into a small valley where slithered a small stream. and then from there was another steep ascent. the previous afternoon, we were in luck because the sun was not in attendance, and the cool wind accompanied us on our way. this time though, it was really hot. 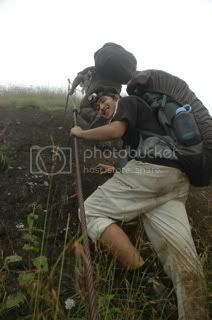 paulo had a hard time trekking because he couldn't use his left hand to hold on to the steps. i kept telling him to look back. the view's fantastic. "may lula ako eh," he said, and kept climbing. below us, our companions looked as if they were crawling up the wall. the sweepers appeared as colorful specks in the distance, distinguished from the monotonous green. at the rest area, while we waited for signs of the sweepers, sir manny and i bandaged paulo's hand and immobilized it with 2 short sticks. by this time, it had appeared a bit swollen, which was cause for some minor concern. TL alvin's left leg was bleeding from a limatik bite, and the trainees looked seriously worried. none of them had even encountered a limatik in the past, and were particularly disturbed by the amount of blood that was oozing. we proceeded with the trek after the short rest and i promised them that the there wouldn't be any hard ascents until after the lunch area, where we were scheduled to deposit our book donations. 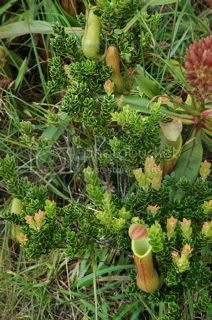 we encountered different types of plantlife along the way, like pitcher plants and ferns. although there was no ascent, going down wasn't necessarily half as difficult. it was slippery and dangerous. just after the stream where we had lunch last year, we entered the mossy walls. they were narrow passageways, more than two persons high and about two shoulder lengths wide, carpeted by moist layers of moss. surely they could not have been man-made. when we emerged from the walls, we saw tacadang in the distance. it had houses spaced far away from each other, as if each house had an entire mountain as its backyard. it wasn't 30 minutes away, but it still felt long. droppings of wild pigs were scattered everywhere. upon reaching the same place where we had kapeng barako and camote last year, we were instructed to have lunch and leave behind our books. in another house was a local who didn't appear to be completely sane: he was wrapped in a blanket, with a deep, penetrating gaze, absorbed in an extended monologue. with what we'd so far done, i wasn't sure who was more mad: he or us. we ate lunch rather gingerly, and before long, one of the locals had brought coffee and bananas. i was the only one who didn't have any coffee, but i did take a banana. sadly, the same views that were here the previous year could not be seen as a fog had rolled in, surrounding us in what seemed like a white vacuum. then we proceeded to the campsite. once again, it was a difficult descent. my trainees sat some of the way, afraid that they'd slip. we were walking down similar crude steps carved on steep walls. in some parts, there was water that trickled down them. 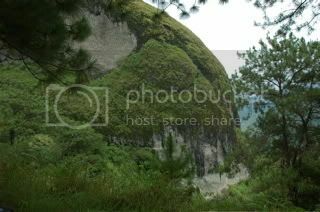 before crossing another hanging bridge, we looked upon an imposing creation of solid rock. on one side, it seemed as if the outer, darker layer had crashed, exposing a lighter, though more jagged complexion. it would have been an ideal place for free climbing, if anyone more foolish than us was willing to undertake it. on our right was another sheer wall of rock or mountain, and in its crevices were coffins, although in the haze of clouds, it was difficult to see. i just told them what they would've seen had it been sunnier. then we crossed the last hanging bridge for the day, the fourth since we started. as we were crossing, i noticed that there was a hole under the bridge. since we were instructed to load on water here, and since i knew the campsite was less than an hour away, i decided to be daring and jump into the hole. i was hesitant at first. the water was almost completely still, unlike the rest of the stream that rushed down with speed and force. i feared there might be some living creature inside it with fangs. but then, i just wanted to make sure i had an audience. and when they were there, i jumped in. not once, not twice, not three times. i also coaxed paulo and jay and mawi to jump into the pool. it was actually quite deep. and nearly round, possibly 12 feet in diameter. and since i was the first to do it, we joked that it was going to be named after me: alman's hole. too bad it rained the entire time and i had no pictures of it. 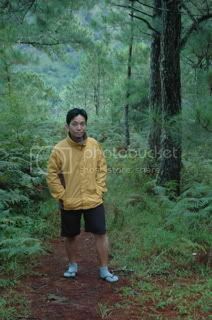 after lingering at the water source, we pushed for the campsite, trekking through a thick forest that dripped endlessly in that stubborn rain. i had 5 more liters of water -- more than most -- but knew the worst was over. i will only get a cramp on the first day, and not on any of the succeeding days. i felt much stronger, and could have carried more were it necessary. 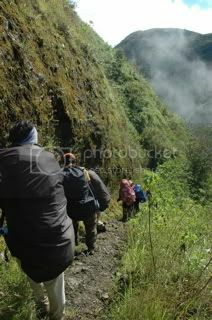 nevertheless, kibungan is turning out to be the most challenging and most complete training climb for 2k6. it had the makings of a memorable climb: a variety of surfaces, the whole spectrum of climates, an array of difficulties, a whole shebang of flora and fauna, and an omnipresent beauty. we kept our pace, and though brody pleaded for a break, i said keep going, we haven't been trekking for 30 minutes. we actually reached the campsite around 35 minutes after we'd started. as if suddenly, the house just appeared. kuya mar and ruben were already asleep in its 2nd floor. it was still raining though, and i said we'll pitch our tents when it stops. after a while, our tents stood just beside the big shed with the second floor. it had been built by the municipality for the locals, in case they are delayed during their treks from their farms to their houses, or from their respective barangays to the poblacion. i asked my trainees to change, and brody took longer than patience could stand. we were wet from the rain, and it was cold outside. he said he was nursing his limatik bites which bled profusely. by the time he'd finished, i myself had dressed and said it took me less than 2 minutes. after that, we tried to organize our campsite. we had difficulty though, with our tarp. the ground, softened by the rain, would not hold on to our pegs, and the tarp kept falling. finally i decided to move the kitchen to the shed, safe from the rain. i just barked orders, and personally cooked a beef in black bean garlic sauce with red and green bell peppers and carrots in the shape of flowers. it was a fantastic dish. "ang sarap nito," jay said. "ito ang pinaka-okay na kanin na natikman ko sa bundok," paulo added. they were great compliments, the downside though is that none of them were responsible for it. i have an altogether different approach to the training, and sir manny and i discussed this while they sat around and their trainees butchered dinner. ours was a quick, delicious dinner, true, but how much did the trainees learn? if not cooking, then they learned something else: operating the stove, cleaning the pots, organizing the kitchen. we kept joking about the incident until a fireball emerged from sir manny's kitchen. "ayan, matututo talaga sila nyan," he joked. "oo nga," i agreed. "pero sunog naman ang kilay." there wasn't much to clean after dinner because jay scraped the last morsel of rice and the beef dish. we readied our liter of vodka while waiting for the other team to finish dinner and start on socials. meanwhile, ruben forced us to imbibe a really foul-tasting brandy, while brody had a hard time convincing us that his scotch whiskey -- a ballantine -- was any good. eventually, we had 4 different drinks: my precious liter of expensive vodka, the ballantine inside a small flask, the cuatro cantos GSM, and the brandy. and while we scared the trainees shitless about limatik bites and spirits, we finished shot after shot of the alcohol. we were kept company by music from my iPod and my altec lansing speakers. soon, the TL's face started to rouge. he insisted it was sunburn. we kept drinking, and kuya mar was peculiarly absent, having turned in earlier than usual. he was mostly in a rush, running after sir manny, and must've been really tired. by 11pm, everyone but my group, mawi, and alvin stirred, and i showed signs of narcolepsy, falling asleep even as i held on to a shot glass. so after that last shot, i decided to turn in. in the middle of the morning, i woke. i felt cold. i wasn't able to close the tent's door, only the vestibule. as i was about to close it, brody talked in his sleep, murmuring something about his acads grade, and snored immediately thereafter. between us was paulo. his head below me, moaning as though he were complaining from something. i went back to sleep. but it didn't feel like i had slept because after what seemed like a short while, paulo's alarm was off. brody wouldn't get up, and paulo later said that he is the only old person he knows who doesn't get up early. i left the tent ahead of everyone, and we quickly prepared breakfast. it was another wonderful morning. dry and refreshing. we were inside the forest. paulo left to answer a major call of nature. i was looking out into nothingness, when two faint lights, like little floating matchsticks on fire, coming from the direction where paulo hid himself, floated towards the campsite, slowly at first, then with speed, disappearing just as i was craning my head, following them with my eyes. i was certain that they weren't fireflies, whose lights blink. they appeared to be flying insects on fire. it was strange, and unfortunately, no one else had seen them. for that morning, we heated pre-cooked beef tapa and chicken tocino. i said it was up to them what to have for either breakfast or lunch. i told them as well to hurry so we can proceed to the viewdeck and enjoy the sights. but it was a slothy morning, and things moved in slow-motion, that we'd finished at 8, when we were supposed to start our trek. i led the way to the viewdeck, stood at the edge, and marveled, once again, at the painfully beautiful landscape that is kibungan. although i was many paces from where the rock suddenly falls steep into a cliff whose end can't be seen, the seniors were very concerned. when we had our pictures taken, they'd shout, almost in unison -- kuya mar, sir manny, ruben -- to be careful! be careful! no further step! after the requisite photos, we returned to the shed and were about to start our trek. locals passed by and they spoke to us. they thanked us for the books and the notebooks we'd donated -- the same ones i wanted to get rid of during the first day. in a place almost totally deprived of mobile communication, word travels fast, and sincere gratitude, even faster. i smiled silently and bade them goodbye when i started walking. i was instructing my trainees on what to expect for the day: a steep descent on primitive steps along the mountain's rock face, an ascent after the bridge, a long descent along a craggy trail, and then one final ascent towards the municipal hall. i predicted we'd be there by 1pm. but things aren't always as you plan them, and not everyone walks with my speed. the first descent was slow. most of the trainees proceeded with a lot of trepidation, careful to slip lest they find themselves plunging headlong to the depths below. it really was a lack of confidence and experience more than anything, and what slows you down is putting fear ahead of yourself. the lanagan stairway had flowers sprouting from its wall of solid rock. down at the bottom, we crossed our fifth bridge, and then went up again, to the ridge. there, we contemplated the experience, munching on trail food. lester and rico initially thought we were within IT, mistaking the massive rock formations as midrock, the globular chunk of geology sticking out of the mountainside. but i said it wasn't. it was further away. so we sped off. i pointed out to the trainees where the crampsite and midrock were, and if i had checked my itinerary, we would have learned we were way behind it. 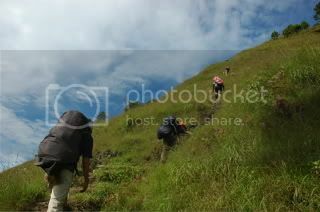 i just knew, while i was walking, and looking at the great challenge ahead -- because the trail going back up to the municipal hall was clearly there -- that alvin had not estimated well. reversing the IT wasn't as easy as adding a few hours to the descent, and slashing some minutes to the original ascent. hence, the miscalculations. 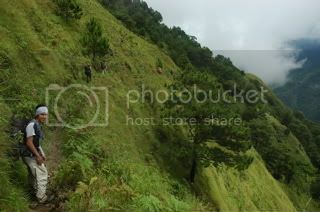 we reached mang gorio's hut at past 1pm, where we had a hurried lunch. we left quickly, as i worried about what time we'd reach baguio with our pace. about 15 minutes later, i realized i'd left my camera at mang gorio's hut. i was confident the sweepers wouldn't leave it behind, but i was more concerned about missing out on many photo opportunities. so i ran back for it. 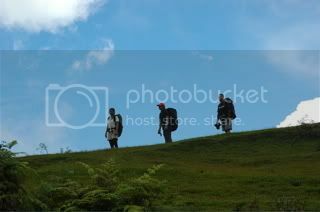 i ran uphill, and when i got there, joyce was just about to stuff the camera into her bag. i said i knew you'd sweep it but i didn't want you to carry any extra load. then i ran down again to where i dropped my bag. with my normal pace, i caught up with my group before the last bridge. this is perhaps the most dangerous of all the bridges, only because it is the one perched the highest. the raging waters rested about 80 to a hundred feet below it. from there, i warned everyone of the last challenge: it's all uphill from here. and here lies the irony. perhaps this is the only climb there is known to me where going home consists of going up. and it was a long ascent that consumed all that was left of my patience. i ran out of it because i felt our pace was too slow, and it was raining, and the itinerary was far from accurate. alvin's not to blame, really, but since an IT sets your expectations, you tend to think that you'd be at a certain place at a certain time. so this delay basically blew away most of my plans. but we pushed on, resisting the temptation to stop too often. just when i expect to see the road, instead i see another uphill climb. finally, concrete stairs! and a store. i purchased a lukewarm royal true orange and shared it with my trainees. the municipal hall should be 10 minutes away, i said, and i continued walking. immediately, i took a bath outdoors, with the view of the mountain that i had just climbed hazy behind some thin clouds in the distance. it felt good to rub soap on my body, and to apply shampoo on my hair. and i finished quickly, with the rest arriving after i had slipped comfortably into dry clothes. there is a temptation, after all that physical exertion, to stare blankly into space and contemplate the experience, but then there is as well the pressing need to get home, to return to the spaces we'd temporarily vacated. i sought out kuya mar and found them having some beers and a very late lunch at a store where on the other table, locals were already very drunk. a man slept on the floor. at the other store, an argument broke out and a drunk man punched a mirror, leaving his hands bloody. i invited myself to kuya mar's treat and ate. then we loaded ourselves to our minibus, and since it was already getting dark, i just lulled myself to sleep, hoping to be in baguio city by 9pm. but it wasn't meant to be, and we were met with a string of unfortunate events. first, the bus's engine died and wouldn't start again, some problem concerning its fuel line, i was later told. not 100 meters away was a truck, going the other direction, also dead on its tracks. this must've been some kind of a bermuda triangle or twilight zone for large vehicles. the delay cost us around 30 minutes. then an hour later, a flat tire. it took another 30 minutes. then after an hour, another obstacle. a jeepney had blocked the path, its front wheels stuck in mud. and it came down to us mountaineers to provide the solution, but not after another 30 minutes or so. 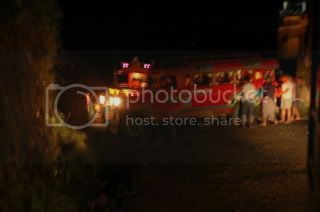 with our help, the jeepney was pulled out of the ditch giving us enough space to continue with our journey. not once during any of these many, long stops, did i go down from the bus. only later did i realize that we were already getting down at the victory liner station, at the ghastly hour of 11pm. o' mai khan was now definitely out of the question. one might think the journey as well as the experience would douse any hint of further adventure and would only result in an interminable longing to get home, such as sir manny who seemed in a frantic rush to get the first bus out of baguio, but instead of following suit, and in spite of work that waited the next day, a few of us opted to take the 1am trip, only so we could chill and relax and at least for a fleeting moment, forget about having to rush, having to be always in a hurry. we agreed to stay at kaffeklatsch for a full hour, munching on pasta, pizza, fries, and a crab wrap, soothing our bodies with coffees and beers. i had planned on sleeping during the entire trip on the way back, although surprisingly, i wasn't quite as sleepy as i had expected. even after the climb, the song of the moment was still "half crazy". we hadn't gone beyond the first three lines of the chorus, and were still very much stuck with the 11 words we could remember. regardless of how possessed by madness our unassuming TL was in his little experiment, we were nevertheless relieved that we'd finished the climb unscathed, and ultimately happy that we were able to take part in something that's best experienced than talked about. i can only do so much in sharing my ordeals and my epiphany on the mountain. but it is altogether different to actually be there, to sit on a flat piece of rock, mute witness to the unfolding beauty, like the blossoming of a flower or the mutation of a butterfly. there is a sign on the gate to the municipal hall which says: "i love my hometown kibungan". how i wish i could say kibungan was my hometown, so at least i could claim to be always going home to a place of beauty. but hometown or not, it is certainly something i most dearly love. ading alman, you deserve it. oh, yeah...my eyes were gluedunto it. i even readit without so much winking 'til the last line. ha ha! not really. your article is so interesting a product of a brilliant mind that can make a true difference in the lives of those who happens to come across it. infact i can see now you are becoming a kibungan celebrity. i'm not your only ikibungan visitor posting comments in your blog. you have hi there anonymous. may you keep sharing your gifts and dedicating your life influencing the global mass spreading speedfast like a contagious desease serving as a shinning star that keeps on twinkling guiding those misleaded living life in wayward ways to see the light. their guiding butattew. ok. let me tell you more about it. according to my late superstitious lola,those are fairies living in the rivers and streams and not everybody has the luck to see them. they only appear usually at dawn to give blessings and luck to those who have the passion, love, commitment, and possess great appreciation towards nature. happens to encounter loneliness along their journey of adventure to enliven their spirits to hang on, keep going on to accomplish their goal. in my case, i encounter 3 kinds of these, butattew, bulalakaw, and the waletwet when i was in high school living a life full of trials and tribulations that i used to cry. my last encounter of the supernatural was when i'm 20 yrs old processing my papers for my overseas self imposed exile. for more inquiries, just give me miss call and i call back. i'm only very convenient to be reach thru my cellphone. here's my number 002886931033843. so much for that. let me read more your lj. i have to take advantage of my time hence i'll be going back to work next week and i have no computer. ha ha..
wow, thank you very much for your kind kind words. it makes me very happy. i actually still owe you guys another story. i was just there in the last week of october, while manila was ravaged by ondoy, and a week before pepeng lashed out on the cordilleras. i am very lucky indeed. i have been to kibungan a total of 5 times. i do not mind going back anytime to explore more and more places. i'm also thankful about your explanations on the buttatew. at least it confirms that i did not merely imagine what i saw. it actually happened. again, my humble thanks for visiting the blog. if you care to read more about your lovely hometown, you can just click on the words "kibungan mountain range" on the left column.